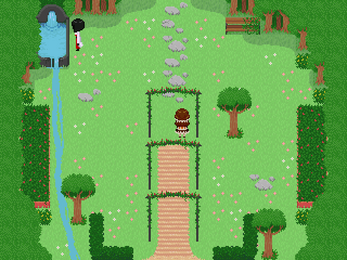 The Stairway is a game made by illydna in RPG Maker 2000. This game has no horror content, and is intended to be a calming experience. It's pretty straightforward, and only has one ending. While the game is available here in both English and Spanish, there are also Russian and Portuguese translations available on the game's tumblr page. A walkthrough is available here. Thank you very much for downloading! Installation is not necessary. To run the game, uncompress the compressed file, and execute RPG_RT.exe from the uncompressed folder. Playing directly from the .rar or .zip file will delete any made saves. If the font is nearly unreadable, install the font "RM2000 8" located in the game folder. This should make the correct font show up. Man this was really fun! I played it all in one sitting and at times it was quite challenging. I enjoyed this game and wish it didnt end!! Thank you! I loved the music! And the colors! And the calmness. I got super emotional when I had to say goodbye to the man in the scarecrow house, felt like I was in the middle of an adventure. This game was filled with a lot of short but powerful little scenes. 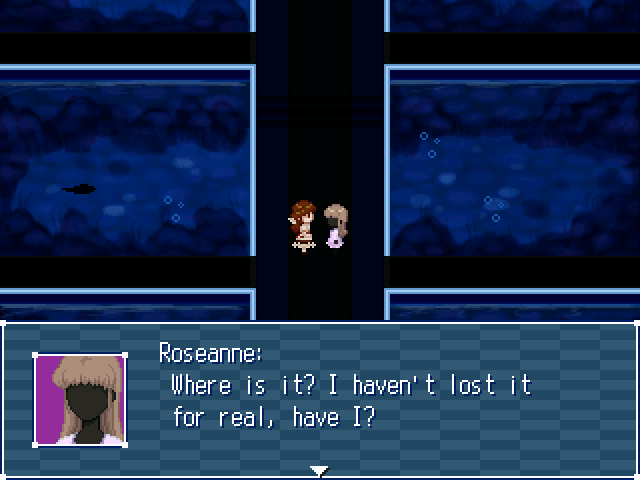 It felt a lot like some of the most positive parts of Yume Nikki, which was super cool because I kept thinking I was in a horror game but kept receiving good vibes, it also had that cozy Alice in Wonderland vibe. Thanks a lot!!! Wonderful game, I really liked the atmosphere, and the dialogue in the scene before the ending was super good. That scene actually made me realize something important about how I overthink things like Stella. Thank you for creating this! I love this game. It reminds me of my best friend (who I also have feelings for). Sometimes he's very distant and I feel like he's leaving me and like Stella, who decided in her mind that Nina left without her, I also think my friend is "leaving without me". And I get lost in my thoughts and in my mind, I am searching for him, like Stella is searching for Nina. In the end, he's always waiting for me, like Nina was waiting for Stella. Thank you so much!! I'm really glad you liked it!! About the font, it's mostly a RPG Maker 2000 problem: the game doesn't detect the correct font unless it's installed in the system, making the unreadable font show up. There is a font called "RM2000 8" in the game folder which needs to be installed (which is mentioned in the install instructions section of this page and the read me text file of the game); this should make everything much more readable. 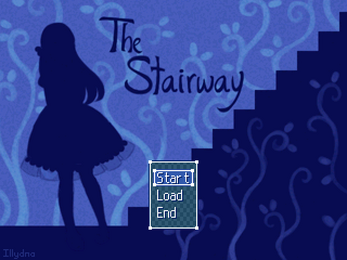 A lot of people have found this problem, probably because they didn't see either of the instructions (which is understandable), but I'll definitely take note for future games since the standard should be not having to install anything ;;; I'm really sorry for the trouble! I relly liked the game!!! 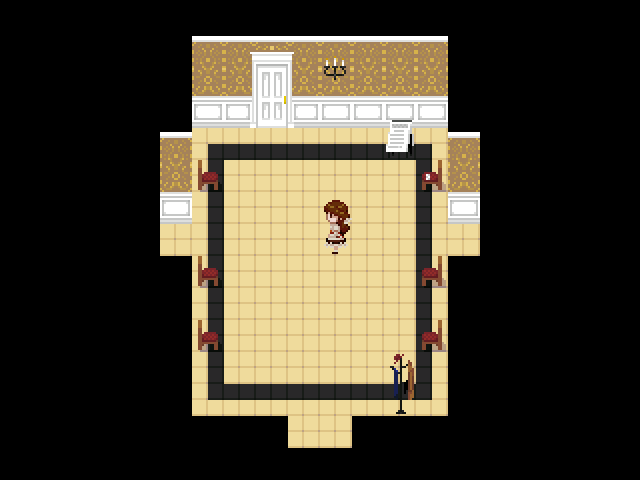 Is nice to see a Non-Horror RPG Maker game!! This was beutiful and i would love to se more games like this! Or perhaps a secuel? A continuation would be fantastic!! That sounds wonderfull!! I would love to play more games similar to this one, the vibe in it is so calming and entertaining!! 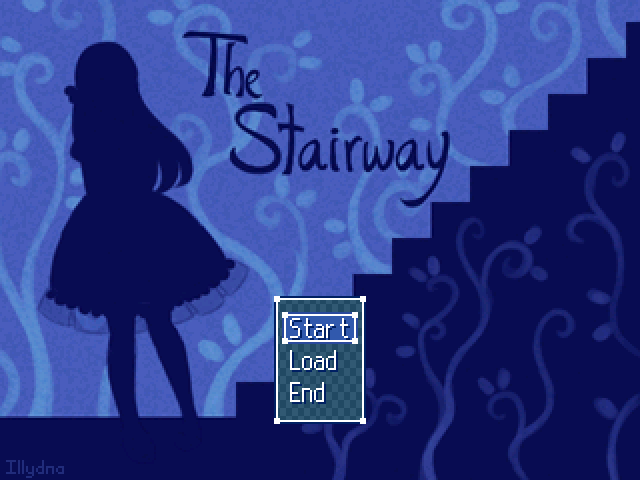 This was a very cute game, and it was really soothing. Would it be possible that we see things through Nina's point of view? Thank you so much for playing! I'm glad you enjoyed it! I love this game!!! Awww such a BEAUTIFULL game ever. Thaks for made this! Hello! if you don't mind, can I make a video about this game for my brazilian channel? Could you make a zip file for the game? What a cute game! I loved it, and was really impressed! All the music is from Music Egg, *CAMeLIA* and Maou Damashii, they all have a lot of really nice royalty free songs! This was way better than what I expected. Excellent atmosphere, I loved the village / library part. There's definitely some Alice in there, but quieter, quainter. I heartily recommend it. Aaah thank you very much, really; and especially for playing. Knowing the atmosphere did its job makes me happier than anything! Thank you very much for these thoughts! it was realy an amazing game, and i guess i should apologize because i was probably just messing arround too much while playing it, but still nice game. About the font problem, the game folder actually includes the correct font, but it has to be installed to work; not having it installed makes the unreadable one show up. 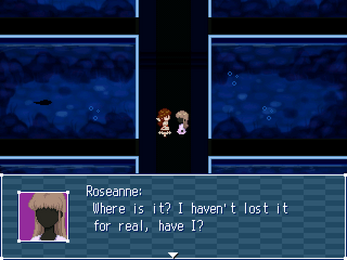 I wish there were more practical ways to keep a readable font on RPG Maker 2000 for everyone, since a lot of people have had this issue and having to install a new font just for that can be kind of a hassle. It's stated on the instruction manual, but I'll also add it to the install instructions here on itch.io just in case! Thanks for mentioning this! I'm really glad you enjoyed it! Thank you very much!! This was an adorable little game. I enjoyed playing it a lot. The art is beautiful and it gives you a little bit of an Alice in Wonderland sort of feel. Thank you very much for playing!! I'm really glad you enjoyed it!